It’s a Saturday afternoon in late July and I’m leaving Maupin, OR to head back to Bend after a great Women for Wild Fish event. My phone pings from the passenger seat. I glance over and see a text come through from one of my close friends, Taylor Geraths. 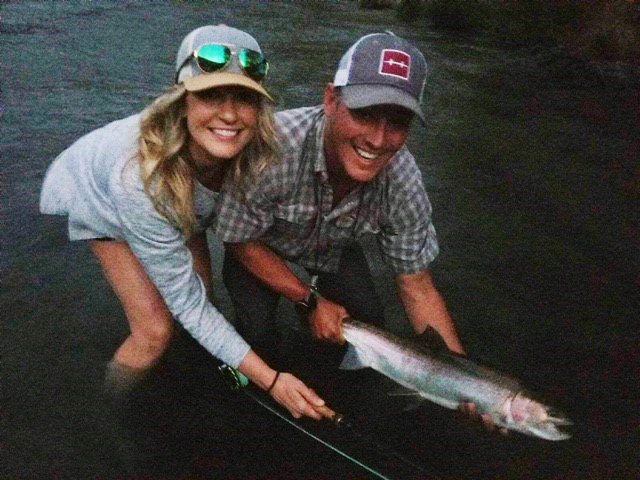 He’s the owner of Taylormade Outfitters, a premier guide service in Central Oregon. I open the text, “There are enough Steelhead in to make it worthwhile. When do you have time to go?” As any angler can attest, the prospect of fishing with great friends will always pique your interest. Within the next 10 minutes, I started figuring out how to sneak out of work for a day, along with all the logistics of getting myself back down to Maupin in 72 hours. 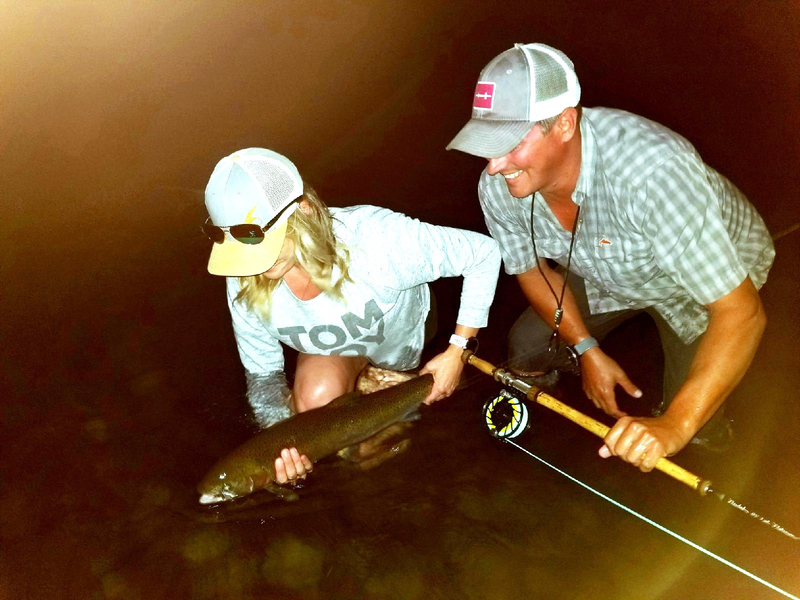 A few texts came through with photos of some beautiful steelhead Taylor’s clients landed on their most recent trip, along with pictures of the devastation left in the wake of the recent wildfires. My heart started racing at the prospect of catching my first steelhead. 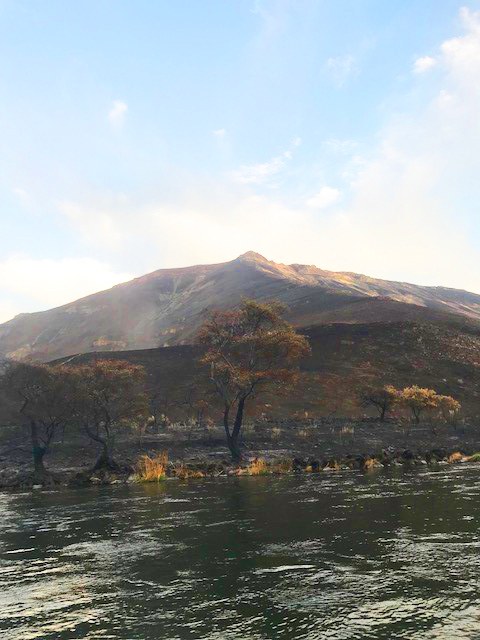 Simultaneously, the sadness of seeing our beloved river ravaged by fire was sobering. I guess I had to experience this all for myself. The draw of these magnificent fish of 10,000 casts and the witnessing landscape forever changed. We added another awesome crew member to the trip, Bruce Berry. Taylor and Bruce have a long history, over 20 years of fishing and friendship. It was all coming together nicely. 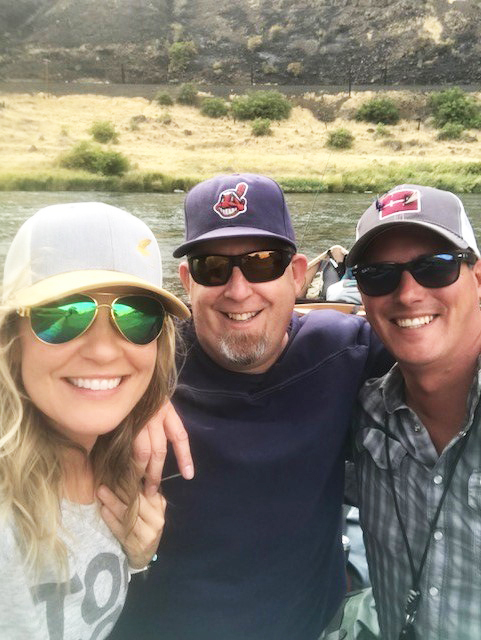 Taylor and I would meet Bruce at Deschutes Angler Fly Shop in Maupin and we’d put in at Mack’s for a 20+ river mile float to the mouth of the Deschutes. Up until this point, Bruce and I had only been in touch over the phone, talking fishing, Beulah rods, and how we’d have to get a group together and hit the river. You know when you meet someone for the first time and it feels like you’ve been friends forever? That is how it is with Bruce. We were telling jokes, sharing stories and our mutual excitement for some time in the wild. 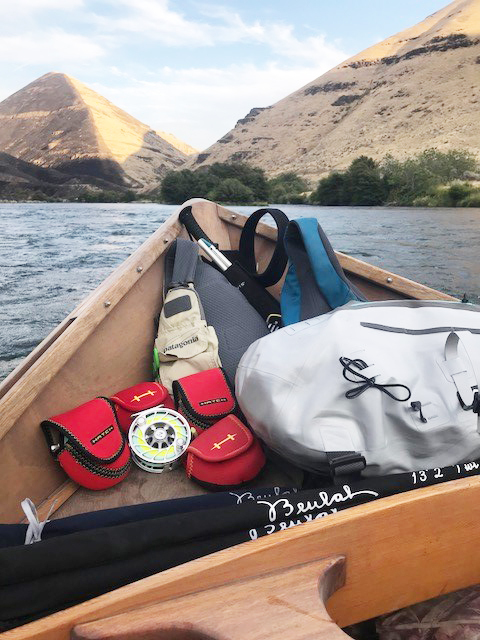 The boat was loaded up, rods assembled and the three of us cruised down the river in Taylor’s beautiful wooden drift boat. The setting sun cast shadows on the canyon hillsides, making it difficult to tell the difference between where the fires raged and where another day was simply coming to an end. A faint smell of smoke lingered on the air, combined with the fresh, cool breeze coming off the water. Caddis hatches swirled around us and the sound of sporadic trout rising had my head on a swivel. I looked over at Taylor and he basically gave me the “we’re not here for trout, we’re here for steel” look and I tried to keep my excitement to myself. Let’s face it: most of us are still pretty damn excited when we hear that distinct sound of fish eating on the surface. I thought it was my drug of choice at this point. I was in for a big surprise. Taylor rows over to the side of the river, sets anchor, and we lace up our wading boots. Bruce hands me a Beulah Platinum 7 weight Spey set up and we begin making our way through a maze of burnt blackberry brambles and six inches of ash. It was otherworldly. In some spots, you could see a salvaged grouping of green grass blades springing up. Others were so blackened, they looked like they could just disintegrate if the wind picked up in the slightest. I fish a lot but the steelhead and two-handed or Spey style casting is very new to me. I acknowledge I have a ton to learn and, in all honesty, I think that is what keeps me so addicted. 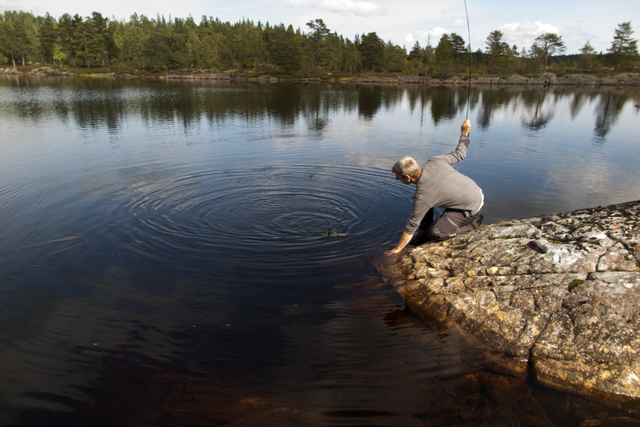 Fly fishing provides an opportunity to challenge yourself and continually be learning. I know I can’t ever master it (well, unless I was Bruce and can throw line with the least amount of effort or Taylor and you can read water so well, you might as well be a fish finder) because a lot of the variables are out of our control. Taylor takes the rod from me and makes a few casts to refresh me on my off-shoulder Snap “C”. It was his fourth or fifth cast and he feels a tug, turns to me with eyes as wide as saucers and proclaims, “There are fish in here.” He hands me the rod and says, “Jenny, we’re burning daylight. Get after it.” I grab the rod and start making a few casts. The wind picks up and Bruce steps in to offer me some coaching on my Snap “C”. Taylor heads downstream to check out a lower pool and I feel a slight tug on the end of my line, the one that every angler hopes for with each step/cast/step. The next thing I know, my reel is spinning and line is hauling down river. A million thoughts run through my mind I remember the fifty times that Taylor has told me over our friendship to NOT SET THE HOOK! I heed his advice and come back to reality: I’ve hooked my first steelhead! Bruce gives me guidance on how to play the fish, trying not to be too over-bearing and I’m holding on for dear life to the rod. Next thing I know, the fish is gone and I’m left with shaking knees, not knowing what the heck just happened. I hang my head in disappointment in myself- what could I have done better? Did I put too much tension on the line? Did I not turn the fish the right direction? I reminded myself that I have so much to learn and that I was fortunate to even connect with a fish that early in the trip, let alone hook one at all. By this time, the sun had set, we had about another 10 minutes or so of light before we need to reel up, float, find and set up camp. Bruce comes up and guides me up river, giving Taylor some room to help land the fish. It jumps and we get a good look at it. “Dude, it’s a donkey!” Tay yells. This fuels my excitement which in turn, makes me hold my breath, filled with determination to bring this fish to hand. I watch the rod bend, the reel scream and I’m praying that this moment will all come together. The next thing I know, Taylor is trying to get a handle on this beast with only a sliver of light left. I exhale. The fight was over and WE landed it, on a fly that Taylor had tied that afternoon. I walk down to Taylor, barely able to utter words, tears start welling in my eyes from sheer joy and thankfulness for the experience. I look down at this beautiful chrome hen- this miraculous fish who has swam through treacherous conditions and thousands of miles- and it all clicks. Now I understand why “Steelheaders” are complete junkies. Feeling that grab and landing that fish will permanently be etched into my memory. I hold the fish upstream and let the current run over her until she starts shaking her tail and disappears into the depths of the run. Turning to Taylor and Bruce, I give them both huge hugs of appreciation for their guidance. There is absolutely no way I would have been able to land that fish without either of them. 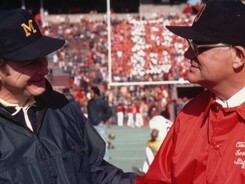 I will eternally be grateful for their coaching and selflessness in that moment. They both could have been fishing. Instead, they allowed me first crack at this run, stood by my side to help, and celebrated like mad when it all came together. 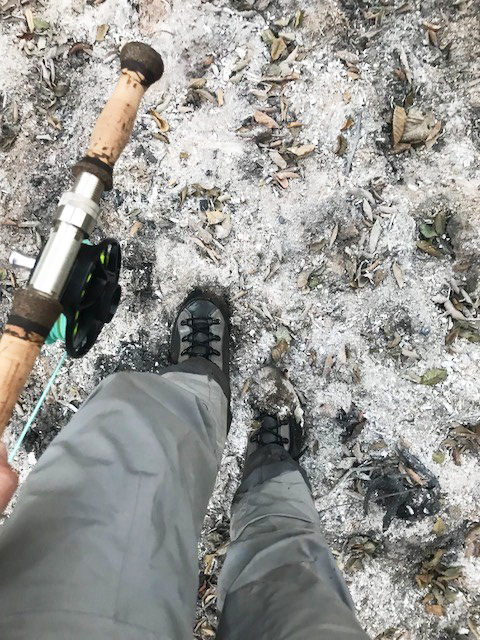 When I was able to get myself together enough to walk, we reeled up and made our way back to the boat to find camp and settle in for the night. As we navigated towards the boat through the ash-covered trail, I knew I was forever changed by this experience- not only for the incredible privilege of connecting with this magnificent fish but for the friendships that were even more tightly bonded by that moment. There is no doubt in my mind some of the best people around are anglers and I was fortunate to have these two amazing guys in my corner. That evening, we sat around in our camp chairs, dirty and exhausted, eating a minimalist dinner of salami, string cheese and Doritos, washing it all down with a cocktail in celebration. I’m sure you could see the perma-grin on my face from a mile away. In that moment, there was no other place I would have rather been than on that river, with those friends, hoping to experience more river magic bright and early the next morning. My little gem is The Platinum 3 weight. I have discovered a new way of fishing in the wooden lakes in my neighborhood in Norway. Actually we are fishing at places, I have thought would be impossible to cast a fly. My fishing buddy Truls taught me the technique. All the pines surrounding the lakes make it difficult to cast without losing the fly in a tree branch, even if you try single hand spey. The 3 weight length of eight feet combined with a line, with 25 feet head makes you put the back cast under the tree branches or roll cast the distance needed. If the wind is right up 40 feet, but usually shorter. The presentation is so delicate that it does not spook the fish. One trout I caught the other day, I stood on and casted from a cliff 15 feet above the water, hiding behind a tree trunk, missed him twice and hooked him on the third strike. The trouts we catch are usually one pound and up. My friend has the the record with a 6 pounder on the three weight. While I was in Mexico, I read a post from my fishing friend about the advantage of a short three weight. I asked James about the Platinum three weight. He highly recommended a custom build one. A choice I never will regret. The difference between the three weight and my four weight Platinum is as big as the difference between the four weight and the Opals I use in Baja. I had to adjust my double haul technique to be less aggressive, but I have gained the possibility to fish places I thought was impossible to fish with a fly. The lakes we are fishing is one hour away by car and then one hour though terrain, were there has been no logging in three hundred years. 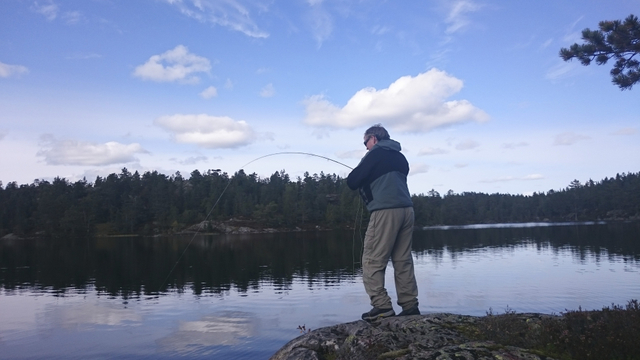 The ice on the waters melts in the end of May and the fishing season ends September 15th. You may discover two or three different species hatching during the day, but if you are in doubt: Daddy long legs and the the Platinum 3 weight is the winning combination. Try it. This Could Be The Best Year Ever. It is turning out to be one of the best and most consistent years for roosterfish in recent history. Fair and consistent weather and a slow but steady climb in water temperatures have all contributed to happy fish. The good supplies of sardines haven’t hurt either. What a contrast to last year. A group of incredibly fun and friendly Ukraine and Russian fisherman and family braved the 32 hr journey to experience Baja and chase roosterfish. We fished 6 days and had boats landing multiple roosterfish daily. Roosterfish ranged from 15 -40lbs, most in the 20-30lb range, with boats taking 2-6 fish a day. One of the guests set out to catch a variety of species and landed 9 before he was done. We could have had a few more but the fishing was concentrated in areas where roosterfish roam. There was a little pressure coming from the south but nothing that couldn’t be avoided. Apparently the bait and fishing in Los Barilles is scant and boats are coming up the coast to fish for a few hour. This has put down the fish at times with the drone of motors and sometimes to close for comfort technique. The Captains see our sardines flying and roosters crashing and can’t resist crashing the party. Around here, a traffic jam is anything over 4 boats and we managed to find our own water by being first and last on the scene. 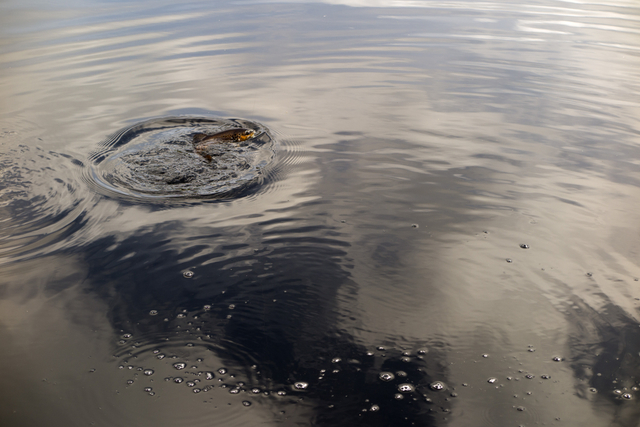 This tactic actually enhanced the fishing with late afternoon action being the best. Whether due to the afternoon high tide, or letting the water settle, we found more fish late. There are plenty of skipjack and jack crevalles , to keep a change of pace and even a pompano or two, but roosterfish are still the fish du jour. Dorado and sails are starting to show offshore, stay tuned for next week when we head out a little deeper. Another great week for roosterfish. weather conditions were generally calm except for a couple afternoons with variable winds, but nothing to get in the way of the catching. All our boats landed and released 2-6 roosterfish per day in the 20-40 lb range. We had a large sierra bite off after exploding on a fly and a couple random species adding to the excitement. The sardines have been plentiful and of good size. Although traffic has been busy, with boats coming up from Los Barilles for sardines, the roosters have been in enough places that you can find your own water. As conditions continue to heat up we expect to see some dorado in the next couple weeks. Here is a view from our “Happy Place” on our way to our “Better Happy Place”. It’s the beginning of the season and we here at Fly Fish Mex are really excited to get on the water. The bags are packed, rods are ready, reels spooled and tested, and we will be on the water Thursday the 2nd. The fishing reports have been all over the place as is the norm for this part of the year on the East Cape and we have had reports of everything from Roosters, Wahoo, and Dorado. Keep tuned in to our site for updated reports along with photos of the catch. Forty five minutes southeast of La Paz is one of the most productive blue water fly fishing areas in the world. Gentle seas, fair weather and a precipitous drop of the ocean floor make this the perfect setting for fly fishing. Add the incredible number of migrating pelagic and resident species and you have a recipe for great fly fishing. 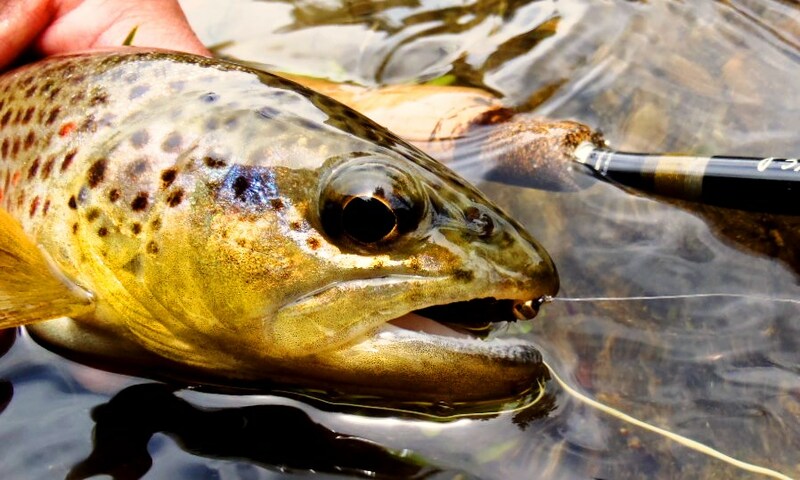 Fishing can be excellent year round but the best action and conditions for fly fishing comes in May, June and July. Fair but hot weather settles into the area and an abundance of bait attracts migrating species like roosterfish, jacks, dorado, billfish, tuna and wahoo. 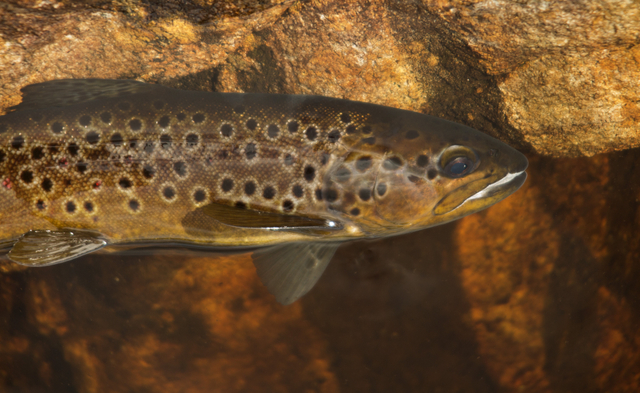 During the summer months all these and more species can be anticipated, but if you have a specific quarry there are certain weeks when your chances are better.